Peter is a senior at Hartsbrook High School. I was extremely lucky to get to spend an hour with him photographing his senior portraits. I got a tour of the school bus he has turned into a little rolling home this past year for his senior project. He very proudly showed me a few of the photographs he has been creating and entering into online competitions. We chatted and photographed around his beautiful home in Montague MA as the sun set. It was very early spring, and we were lucky to have a nice evening, not too cold, the light shining golden on his hair as we posed in chairs and on stairs and by the ivy I so love, growing up the bricks on the side of the house. 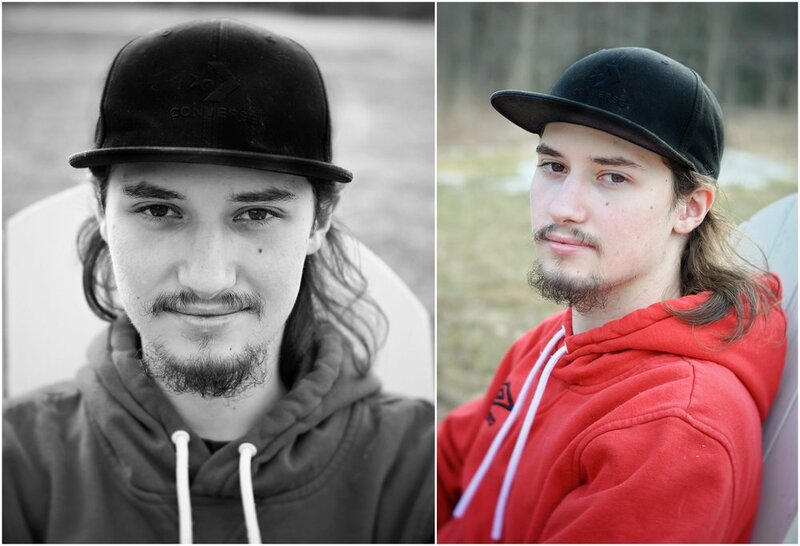 I hope you enjoy these images as much as I enjoyed spending a very quick hour with this lovely young man! Good luck next year Peter I know you will do very well! I love how creative all of the high school seniors are these days! Peter created this bus himself over the past year. It used to have nothing but bucket seats inside, but now it has cabinets, a bed, storage space, solar panels on top, regular and mood lighting! I just watched his senior presentation discussing the project last night, it is quite impressive! To match the creativity and energy the seniors bring to their shoots, I bring a vintage Pentax K1000 loaded with Psychedelic Blues Film and a Vintage SX-70 Polaroid Camera loaded with expired Impossible Project Film as well as my digital camera with a normal lens and in this case, the Lensbaby Velvet 56 to create a one of a kind, artistic photo shoot! The image above were created with a vintage Pentax and Psychedelic Blues Experimental Film that I just love using these days! What a fun and artistic addition to a creative senior photo session! I love to pull out all the toys for my senior sessions. Your senior is special, so go for an extra special photo shoot! I promise... you will not regret it. I always take a few instant images, The images below were created with a vintage SX-70 Sonar camera. I take them home, scan them, give them a bit of time to cure in a light tight box, and then carefully hand deliver them to your special graduating senior! This is such a sweet and tangible gift that I love to give each and every family! This was my last roll of 600 Impossible Project Film, Which has been discontinued, my next shoot will have the new Polaroid Originals film. These are beautiful, tangible, little images that I know you and your senior will treasure next year, and the year after and the year after that! I love the day I get to hand these little presents to the parents! Peter was very proud to show me some of his own images, the flower was taken on the Bridge Of Flowers in Shelburn Falls MA last summer. It sounds like he and his family had a lovely day, he was very happy to show me his colorful photos from the trip! If you are looking for a senior photo shoot that is elevated from the norm, please contact me anytime with any questions! I would love to work with you and your family to create a beautiful and timeless senior session! These kids go off to college as young high school graduates, but the first year just flies by! And by the time they come back, they are full on adults. It is amazing, I would love to capture this amazing moment in the life of your family! I will come with all of my fun tools and film and capture them and the activities they feel passionate about! I do love this work and am always extremely honored and grateful to create images you will love and look back on for years and years and years to come! Even Peter’s adorable dog Orson got in on this shoot! Look at Orson, all regal there on Psychedelic Blues Film! My gear for Peter’s shoot is typical of what I bring to every senior photo session! Contact me if you are called to create magical and creative images with your senior, I know I would love to work with you to capture memories you will treasure forever!